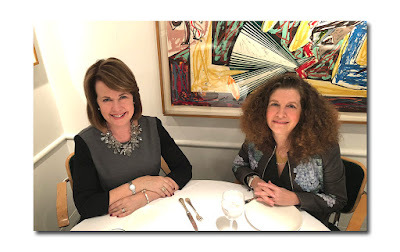 ﻿ On the heels of last Friday’s Royal Wedding, (with so much non stop focus on all things British leading up to the event for weeks if not months), it was hard not to pick up on a decidedly British vibe continuing in New York this past week. On Monday, it was a veritable British invasion (and a welcome one at that) as the late Alexander McQueen (and of course his successor Sarah Burton) were feted at the Met’s Costume Institute, thanks to the opening of the appropriately mind boggling exhibition, “Alexander McQueen: Savage Beauty”. Prior to the Gala (better known as the "Party of the Year"), British accents were the order of the day, what with Thomas Campbell, Sarah Burton, Stella McCartney, and Andrew Bolton, making their remarks during the course of a morning press preview (Fellow Brit, Anna Wintour, seated in the front row, did not get up to speak, but she was lauded by all for her efforts on behalf of the Costume Institute). 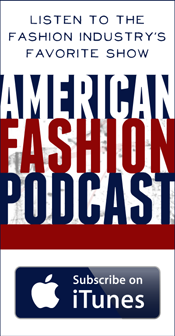 And then there was the eccentric British brewery heiress, fashion icon, McQueen muse and longtime friend, Daphne Guinness. As someone who is hard NOT to notice, she all but ‘owned’ Monday, and gave new meaning to ‘window dressing’, as she literally ‘got dressed’ in Barneys Madison Avenue windows on Monday evening right before the "Party of the Year" (in McQueen of course) with a throng outside who gathered to view the happening. Yesterday, fabulously eccentric headgear (sculptural hats and yes, those fascinating ‘fascinators’), many bearing an undeniable similarity to (though totally outshining) those normally seen at Ascot and more recently, perched on the heads of the guests at Westminster Abbey, were out in all their glory at the 29th Annual Frederick Law Olmsted Awards Luncheon. 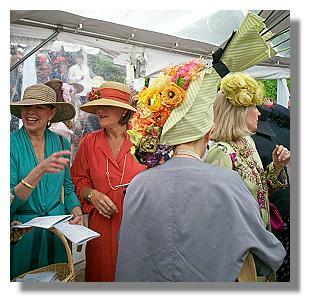 Hats have always taken center stage at this wildly popular and highly successful money raising event, which takes place in Central Park’s lush Conservatory Gardens, but Matt Lauer didn’t seem to know that (and why would he?). As I reported, during the course of last Friday’s Royal Wedding telecast, upon seeing Victoria Beckham in her Philip Treacy ‘fascinator’, the Today Show host was prompted to ask, “Do you suppose this will start a hat revival?” FYI Matt: wonderful hats never go out of style and are totally appropriate for many occasions (the FLO Luncheon is one place where you almost feel ‘naked’ if you don’t don some sort of hat). Coincidentally, while it’s been said that “It never rains” on the FLO Awards Luncheon, it did this time around, throwing a beautiful, moody, and damp cast (though spirits were anything but damp) over the glorious Central Park Conservancy and invoking an even more typical British feeling. And you had better believe the folks in charge were prepared. 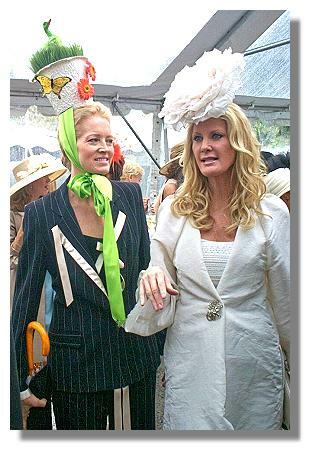 While the luncheon itself has always taken place under a massive tent, this year, the entire entryway into the fabulously bedecked Conservancy was covered similarly, protecting the designer threads and spectacular hats worn by the almost 1000 guests. There was even a thoughtful coat check area for guests who wanted to rid themselves of their cumbersome or wet outwear. While I can’t say I welcomed the unseasonably cool and inclement weather (it felt more like March than May), I was looking forward to seeing how the guests would brave the elements, so speak. 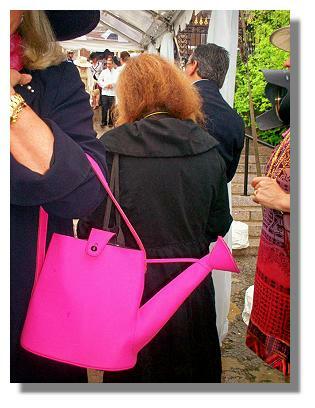 One inventive woman bucked the trend of carrying a status Chanel or Hermes bag, and opted for a hot pink neoprene bag in the shape of a watering can (how apropos was that?) And instead of an expected tan trench and rubber wellies, Sharon Coplan Hurowitz wore a see through plastic Fendi raincoat (all the better to see the Chanel dress beneath), matching shoes, and a quirky Chanel headpiece that resembled mouse ears. More than a few women actually wore furs (mainly abbreviated shrugs although one woman pulled out her floor length shearling vest). But by in large, most chose to ignore the weather altogether and celebrate the theme of the day and Mother Nature in all her glory. 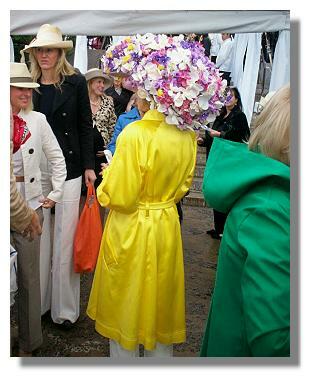 Amy Fine Collins opted for a huge butterfly headpiece which she wore with a lilac sheer trench, and there were many out there, over the top headpieces resplendent with trees, plants, and flowers. Standouts include the witty hat worn and made by Carole McDermott, complete with a house decorated with sailboats, trees, and a park bench with a placard that read, Adopt a Bench; Carole Bryant’s flower pot hat which she toned down with a subdued menswear inspired navy pinstripe pantsuit; and one guest whose large hat resembled a huge floral bouquet still wrapped up in the paper. Sandra Lee, Governor Andrew Cuomo’s ‘companion’, known for dressing in white almost all the time (she always seems to be going to her own wedding), arrived in a tailored white suit and huge white floral headpiece. FYI, some of the male guests managed to stand out by virtue of colorful hats or in the case of PR Guru James LaForce, with his bright orange tie, and not surprisingly, some of the more interestingly dressed guests were milliners (Lisa Hoenshell Boone and Satya Twena for example), who were more than happy to hand me their business cards when I asked for more information. 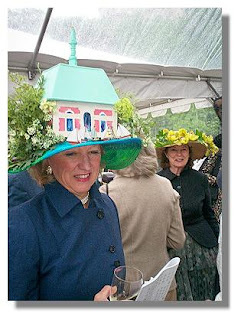 (Ms. Twena told me she made hats for 7 guests). But the beauty of this event is that it is not just about looking good, but doing good, and the Women’s Committee (which was founded in 1983 by four ‘visionary’ women), is dedicated to the beautification and preservation of Central Park, raising almost 20 percent of the Conservancy’s $37.4 million annual, park- wide budget. This luncheon has already raised almost $3 Million (100% of the ticket sales go to the Park). I love the hats. What a great occasion to wear them. So festive! !